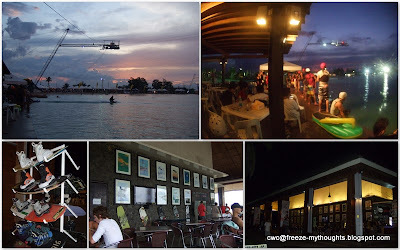 After our successful encounter with the whale sharks in Donsol, we were off to discover Camsur Watersports Complex (CWC) in Pili, Camarines Sur. It was an hour land trip from Donsol, Sorsogon to FilCab/GT Express Daraga Terminal. In Daraga Terminal, several vans are waiting in line for hire. 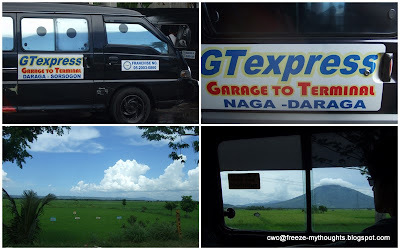 At P140 per head, we found our way to Pili, Camarines Sur two hours later on a Daraga - Naga van for hire. That's a lot of savings compared to hiring a private van at P3000. We got off on the highway, crossed the street and rode a tricycle leading to the Eco Village inside the complex of the Capitol. At P7.50 each, five of us and a stranger were forced to cramp inside this tricycle with our bags and luggage on top since the driver refused to have it all to ourselves. I made reservations with Eco Village. Quite disappointed with what we saw, we had to look into the rooms first before we checked-in. Facilities and rooms are unfortunately not well maintained and dilapidated. The cabins looked more like dog houses (excuse me for such comparison but it's what I think it looked like). Even the staff could not give a decent answer if the rooms are good. The eco village concept would have been nice. I guess the reviews I read was written many years ago. Good that I've researched beforehand, I knew of other options. We asked if there is available room in the cabanas. Timely, the WWA Wakeboard Championship just concluded the previous day, there were available rooms. So we had to lag our bags again and cramp on a small tricycle further into the complex. Voila! I was happy with what I saw. 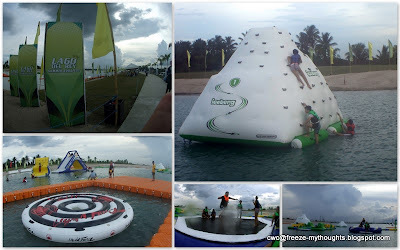 Accommodations at Villa del Rey is what I envisioned CamSur Watersports Complex is, clean and world-class. The front desk of Villa del Rey was right next to Villa del Rey Villas the most luxurious accommodation available in the complex with this huge pool nestled in the middle. Across the street is where the Villa Del Rey Wood Cabins and Villa del Rey Containers are lined together in a spacious lot. On the other side is the Villa Del Rey Cabanas. These villas are just a block away from the wakeboarding cable park, you can actually see the park from this point, definitely convenient as it is within walking distance. CWC complex is vast, the Mansion and Eco Village are within the compound but you need transportation (by trike or free shuttle) to and from the park. The tiki huts are situated right next to the pool/restaurant/cable park. We settled in the Cabanas at P1350/room for two. I could not understand how the pricing scheme is but the accommodations in this newer area are cheaper than the rooms in eco village. The WWA World Championship just concluded but the place is still packed with foreigners. I assume many of them joined the competition. The complex is equipped with free wi-fi, club house, swimming pool and more. Wakeboarding fees is reasonably priced, check out their website for applicable rates. As much as I wanted to try it out, I know I can't pull it off. The queue was long, once you fall you have to queue at the end of the line again so we opted to go to Lago del Rey. Open daily from 830am to 6pm. Lago del Rey Aquapark is just across the street, I saw this featured on Sports Unlimited a few weeks before our trip and it looked so much fun. It's a fresh water man-made lagoon, 5 to 20 feet deep, filled with inflatables for aquasports. A lifevest is provided and must be worn at all times. For P120 an hour or P380 per day, kids will enjoy the kiddie round inflatable and wading pool, while adults will enjoy playing on a slide, a seesaw, an obstacle course, a volleyball court, a trampoline and an iceberg (for wall climbing). Sailboats and jetski are also available for rent. It's so much fun being a kid for a day. Food is available only at the clubhouse or at the Mansion for about P150 to P300/meal. Food kiosks are also available on special events. Villa del Rey is walking distance to the wakeboarding complex and Lago del Rey. You'll need a ride going to and from the Eco Village and the Mansion. Free shuttle service is available around the complex but if there are too many guests, it would be difficult to find one. There's also a free shuttle that will take one from CWC to Naga City for about 15 minutes ride on a scheduled trip (9am, 2pm, 7pm). The airport is in Naga City, and so is the van and bus terminal. The 9am free shuttle service to Naga dropped us off at the FilCab/GT Express van terminal in Naga, right across the soon to open SM Naga. At the van terminal, we managed to talk it through, to drop us directly at Legaspi airport for P150/head. It's two and a half hour land trip from Naga City back to Legaspi City, just in time for our flight. Hail to the governor who has a vision to develop something like this. I hope they can keep up with the maintenance of the facilities more than his term in office and not just build and build something new. For my reader's info, it's taxpayers money that funds this project. If there is anything that is remaining in my wish list for Bicol, I'd say Camaroan. See, the list just keeps getting longer! the bed we had was big enough for one. it might be too cramped, you might want to look into other options like the container vans. Hi is it allowed to bring or cook foods? our flight to Naga is next week, I'm hoping for a response. Thank you. I would suppose bringing of food is ok. But cooking? Im not quite sure about that.